Email has become one of the top traffic drivers to BuzzFeed as the digital publication continues to test new ways to engage with readers. While social media is by far the company's largest driver of traffic, email plays a powerful role as a source of revenue and engagement for the company. BuzzFeed now offers more than a dozen newsletters of varying genres, including a daily news summary and a cat-a-day newsletter. Interestingly, subscribers to BuzzFeed’s cat-a-day newsletter actually share more BuzzFeed content when compared to any other reader segment. In addition to its newsletter series, BuzzFeed has offered a variety of email-based courses throughout the year. For example, BuzzFeed launched a seven-day skin challenge with open rates above 52% and more than 100,000 readers signed up for the company’s 27-day core challenge, which had a 39% open rate. The first thing Oshinsky did when he joined the company in 2012 was to cancel the previous email program and begin again from scratch. Oshinsky says that at the time, nobody managed email communication and no messages were optimized for mobile devices. BuzzFeed has been working with Campaign Monitor, an email marketing technology provider, for the past three years -- and Oshinsky praises the company’s easy-to-use interface and responsive email templates. Since Oshinsky joined BuzzFeed, the company’s email team has grown to four employees in New York, two in London, and several more email team members in Mexico, Brazil and Australia. Emails are sent in English, Spanish and Portuguese for now, but courses have also been translated to French and German. Tone plays an important role in email marketing, says Oshinsky, and readers respond to a brand's distinctive and consistent voice. BuzzFeed has experimented with more targeted outreach based on geo-indicators for product launches and live events in particular regions, but Oshinsky hopes to add more personalized outreach based on geolocation in the near future. 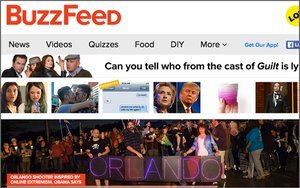 As of now, BuzzFeed’s email newsletters are sent at the same time a subscriber initially signed-up for them, but Oshinsky would like to ensure that those emails are compatible with a reader’s time zone. Oshinsky is also working on integrating video and podcasts more succinctly with the publication’s email program, and plans to role out a new newsletter highlighting the Reader Section of BuzzFeed in the near future.